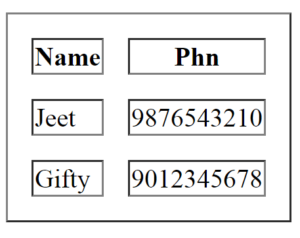 The HTML table tag is used to represent data in a tabular form (row * column). There can be a number of rows and columns. 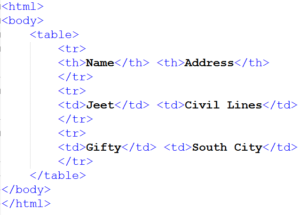 The HTML tables can arrange any type of data such as text, images, links. 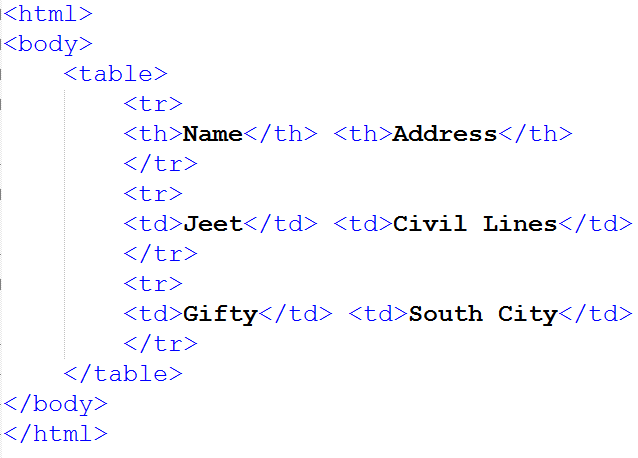 The HTML tables are created by using <table> tag which is the main tag in HTML. 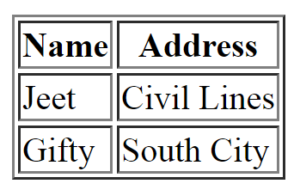 Here, the <tr> tag is used to create rows in a table. 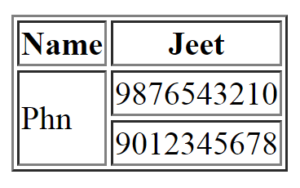 The <td> tag is used to create data in a cell of the table and the <th> tag is used to create heading in the table. In simple words, <th> tag make your text little emphasised as compared to the rest of text. <th> Defines a header cell. <caption> Defines the table caption. 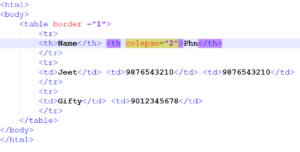 <col> <colgroup> element to specify column properties for each column. <tbody> Group the body content. <thead> Group the header content. <tfoot> Group the footer content. 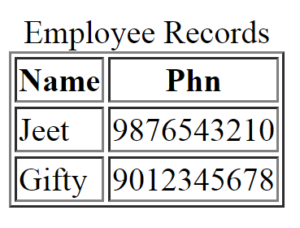 As the above mentioned table shows the data in the tabular form, however, this does not have any borders. 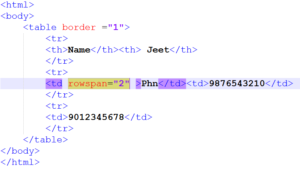 Borders help make data more readable, organised and easy to understand. Now, let’s understand how to create a table with desired borders. Let’s understand both methods one by one with example. 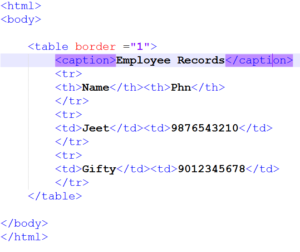 In the table, you can use the border attribute to specify border. 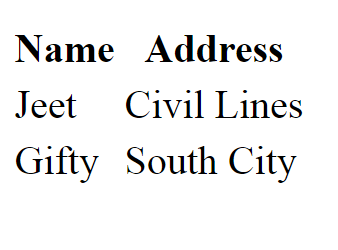 Here, the second way, use the border property of CSS to specify the border in the table. 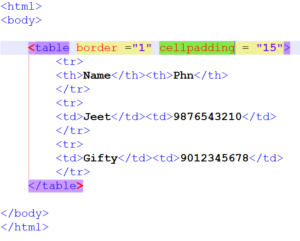 The cell padding attribute of HTML table tag is obsolete now. It is recommended to use CSS. So let’s see the code of CSS. You can use the rowspan attribute when you want to make a cell span more than one row then the rowspan attribute will help you. 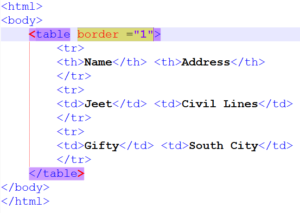 HTML caption is displayed above the table. It must be used after table tag only. 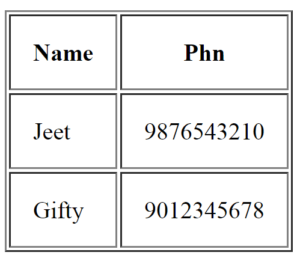 Hope this blog post will help understanding the concept of tables in HTML better. Let us know if you have any suggestions for the published content on the site. Feel free to contact us if you wish to register yourself in our skill upgradation courses. I have been exploring for a little for any high-quality articles or blog posts in this kind of space . Exploring in Yahoo I at last stumbled upon this website. Studying this information So i’m satisfied to exhibit that I’ve an incredibly excellent uncanny feeling I came upon exactly what I needed. I most unquestionably will make certain to don?t omit this web site and give it a look regularly.